Tailgating in Philadelphia - Rent a Party Bus & Bring Your Best Sports Fans! Philadelphia Tailgating – The #1 Sports Party Town! Philadelphia is a sports city through and through, making it a great place to go tailgating. With the Eagles, Flyers, and Phillies in town, it’s rare that there’s not a good tailgating party to be found, as well as some of the best fans in sports. If you’re new in town, looking to try tailgating for the first time, or just want to find the best sports party around, here are some Philadelphia tailgating tips and trick to help you have the best time out there with some of our great local fans. The most common place to tailgate is the parking lot of the stadium where the game is going to be. Be sure to arrive early, as it gets crowded. Philadelphia fans aren’t fair weather fans! You’ll often find fans starting their tailgating parties as early as 8:00 AM, sometimes in some very chilly weather. The only way to really beat the crowds is to be there the minute the parking lots opens for tailgaters. Show your spirit! Philly fans are loud and proud. Even if you’re just visiting the city, join in! Even if you don’t have a favorite player, a t-shirt will do the trick, too. Also be sure to check the weather so you know if you need a jacket or sweatshirt. Talk to other people! Why go to a party if you aren’t going to chat with the other people there? Don’t be shy. Talk to people, especially if they offer you food or drinks. You’ll meet some great folks with some fun tales to tell. A lot of people who have trucks, vans, or even buses set up for tailgating will often bring games, drinking and otherwise. See if you can join in. These games are usually a lot more fun with more people involved. Even if a game of flip the cup, for instance, isn’t your thing, enjoy watching other people and talking to your fellow onlookers. Bring food. There’s a lot of great tailgating recipes that are easy to make and can serve up some heaping servings. You don’t even need to bring a large meal, just bring some good donuts, some cookies, or anything you can buy or prepare in advance. There’s a lot of food to be found at Philadelphia tailgating, from chili to grilled burgers, and having something to bring to the party will make it even more fun. Stay off your phone as much as you can. You’re really here to hang out with your fellow fans. Take a few pictures, but enjoy the chance for face to face interaction. It’s far too rare these days and well worth not checking social media every five seconds. Mind your manners. Philly fans are as welcoming as can be to people at a tailgate, but be careful not intrude. Make sure that you can use a restroom or that food is up for grabs. If you need help, ask people and you are likely to find it. Many local restaurants and bars have deals on game days. If it’s too cold out for you at the tailgating or you just want to go somewhere a bit calmer, hit up some of Philly’s great local eateries and watering holes near the stadium. 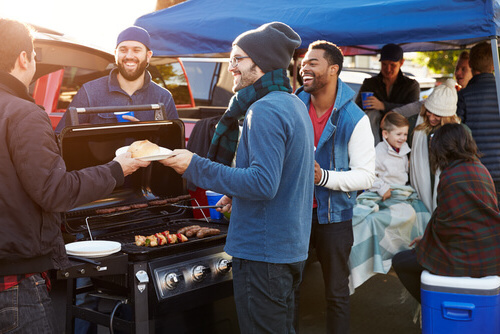 Tailgating isn’t just for sporting events, either. If there’s a big concert in town, there’s some great tailgating to be found! Tailgating in Philadelphia is an awesome experience. Let us at Chic’s Limousine help you enjoy your Philly tailgating experience in a whole new way. We are happy to provide party buses to Wells Fargo Center, Citizens Bank Park, and Lincoln Financial Field. We provide everything you need for the ultimate tailgating party. All you need to do is bring the beer. Contact us today to start making those tailgating plans!